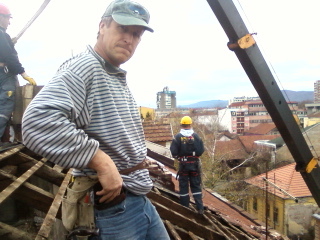 Jovica on a roof with an improvised crane. “I’d like to share with you what has happened here in Kraljevo. “We planned that five people would come for five days. SIXTEEN people come for TWO WEEKS! We’ve worked in SEVENTEEN locations repairing roofs, walls and chimneys. On the roofs above Kraljevo, a team of sixteen helped to prepare the damaged houses for the winter.A new roof takes shape. Great to read about the material and physical help that Evangelical Christians are able to give to the people of Kraljevo, combined with the spiritual and emotional help, which together demonstrates the love of Jesus.